The other day I passed by Apple’s flagship store in Covent Garden/London and was almost magically pulled into it by its wondrous atmosphere. It is huge, open, filled with light and incredibly empty. By empty I don’t mean lacking visitors, as people were clearly playing around with the gadgets and computers on display (though there could have been a lot more people, given that it was half-term). What I mean by empty is that it was empty of anything that resembles a store, i.e. shelves, products, boxes. 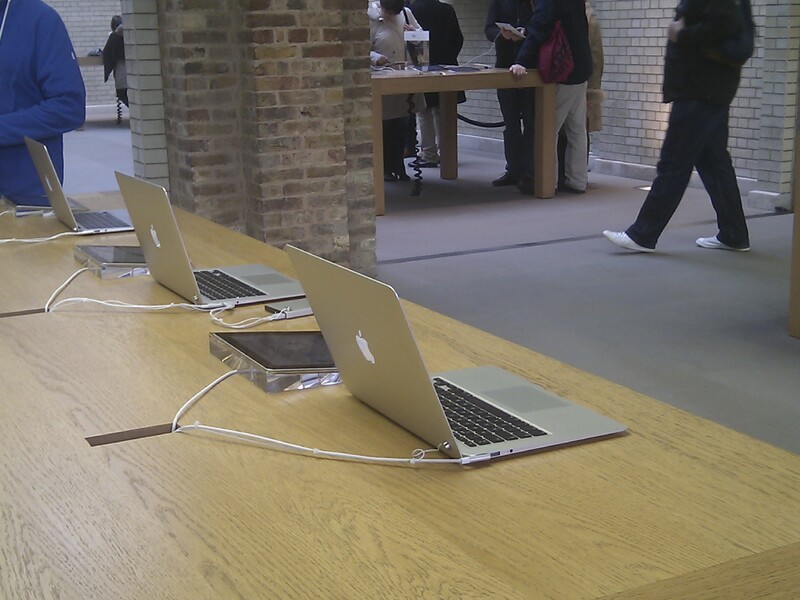 Instead there were dozens of staff in blue t-shirts waiting to interact with customers (apparently 300 staff are employed at Apple Covent Garden) and some simple wooden tables with Apple’s products waiting to be played with. The emptiness of the store is stunningly generous and does not give the impression of an ordinary shop, especially if you consider the prime location and the premium a square foot of land must cost in this corner of the world. So what is this place? A store to sell Apple’s products? A cathedral for Apple’s large fan community, where they can come and worship the design and greatness of the products? An interactive museum for people to come in, enjoy themselves and learn? 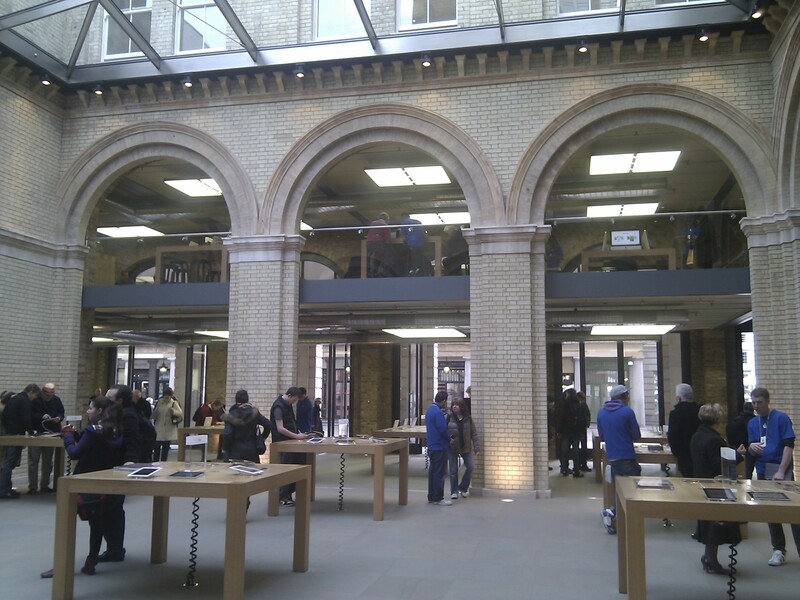 The Covent Garden Apple flagship store, opened in August 2010, is the largest of all Apple stores worldwide. It follows the first London Apple flagship store on Regent Street, which according to analysts is the most profitable shop in London with annual takings of around £2,000 per square foot of shop area (more than twice than other retailers including Harrods or Topshop). This would suggest that the Apple stores are in fact shops, and very successful shops it seems. But why then doesn’t it feel like a shop? And, more interestingly, what does it feel like? Certainly, the Covent Garden Apple Store is no cathedral either. It lacks the axiality so commonly used in religious buildings (see Hillier’s ‘Space is the Machine’ [p. 174-175] for a more detailed argument) and is too individualistic in its usage and social behaviours. There is no common ritual or joined experience as in a church. Seen as a spatial layout, the store could be a museum in its open-plan configuration, large view-sheds, high ceilings, and displays. But then the usage patterns are not museum-like at all. There is no pedagogical intent inherent in the setup, no route through the space, no exploration of different exhibits. In fact, the exhibits are mostly identical. One macbook next to the other. One iPad next to the other. All shiny and new. To answer the question what Apple’s flagship stores really are, two different sources can shed light on the debate: firstly, Apple’s strategy to enter the retail world, as for instance reported by the CNN, and secondly, a piece of analysis of branded experiences in retail environments, done by one of my former students at UCL, Garyfalia Palaiologou. Suddenly it all makes sense. It is a place for building relationships. That’s why 300 staff are needed. It is a club, distinguished by its members, who are joined together by their adoration for Apple’s products. In theory anyone can join. You can go in, just play around on an iPad for an hour and leave again. Staff will interact with you if you so wish and lend their faces to the purpose of building a personal relationship between Apple and you. Or they leave you alone if you just want to indulge in the gadgets. So on the one hand the stores articulate the desire to be a club, appealing to young customers, willing to spend money. Clubs are by definition exclusive. Entry barriers definitely exist despite the marketing talk of openness. Who would want to go to a club, but not really be part of it by owning the status symbols of its members? Apple products are certainly not cheap and appeal to well-off, young, and hip urbanites. On the other hand, Apple manages to achieve an inclusive atmosphere by means of its spatial configuration, as Garyfalia’s analysis of an Apple flagship store shows. The store is highly accessible from the outside and entirely visible internally with large view-sheds; it allows customers to choose their own routes through the space and thus creates co-presence, contiguity and encounter. As such it is a model for a strong spatial solidarity – joining people together by means of closeness and proximity. So in essence, the Apple store in Covent Garden is a little bit shop (because it sells products), a little bit museum (because of its interactive displays), a little bit club (because of the exclusive character of Apple products), and a little bit playground (because it fosters relationships). All in one building. Maybe this is the new prototype of exclusive and expensive shopping for designer goods. The shop as a club. Sounds familiar from all the workplace strategies I’ve heard and read about, for instance in Duffy’s ‘The New Office’. It definitely is clever marketing – allowing the public to experience a seemingly open, welcoming and generous space; allowing people to play with the latest gadgets; enabling relationships with a desirable brand; allowing users to co-create the brand through their narratives of usage; and essentially turning the public into paying customers sooner or later.